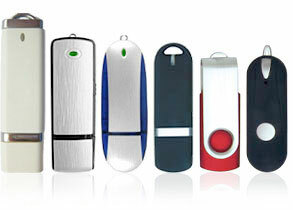 We're specialists in USB flash drives for orders from 25 to 1 million! Whether you are looking to preload customized content on a highly reliable drive or to custom print a logo on a promotional flash drive, we have the right solution for you with the industry's best service and at the right price! Choose from a selection of our popular or unique models to customize with your company logo and colors. If you want to create your own drive, just contact one of our sales representatives. Take advantage of our duplication services to create a great marketing tool for your company. With our pre loading software, USB Media can load any and all documents including product catalogs, marketing presentations, and software distribution. We guarantee the best service, value, and quality at low prices. Thanks for taking the time to browse our site - we'd love to hear from you with any thoughts or inquiries.